Progress in malaria control was among the reasons the WHO African region experienced the greatest increase in life expectancy since 2000 – by 9.4 years to 60 years. Dramatic gains in life expectancy have been made globally since 2000, but major health inequalities persist within and among countries, a new report published today by the World Health Organization (WHO) has found. According to this year’s World Health Statistics: Monitoring Health for the SDGs, life expectancy increased by five years between 2000 and 2015, the fastest increase since the 1960s. Those gains reverse declines during the 1990s, when life expectancy fell in Africa because of the AIDS epidemic and in Eastern Europe following the collapse of the Soviet Union, WHO noted in a press release. The increase was greatest in the WHO African region, where life expectancy increased by 9.4 years to 60 years, driven mainly by improvements in child survival, progress in malaria control and expanded access to antiretrovirals for treatment of HIV. Global life expectancy for children born in 2015 was 71.4 years (73.8 years for females and 69.1 years for males), but an individual child’s outlook depends on where he or she is born, WHO said. The report shows that newborns in 29 countries – all of them high-income – have an average life expectancy of 80 years or more, while newborns in 22 others – all of them in sub-Saharan Africa – have life expectancy of less than 60 years. With an average lifespan of 86.8 years, women in Japan can expect to live the longest. Switzerland enjoys the longest average survival for men, at 81.3 years. People in Sierra Leone have the world’s lowest life expectancy for both sexes: 50.8 years for women and 49.3 years for men, WHO said. WHO highlighted that his year’s report brings together the most recent data on the health-related targets within the Sustainable Development Goals (SDGs) adopted by the UN General Assembly in September 2015. The report highlights significant data gaps that will need to be filled in order to reliably track progress towards the health-related SDGs. For example, an estimated 53 per cent of deaths globally aren’t registered, although several countries – including Brazil, China, Iran, South Africa and Turkey – have made considerable progress in that area, WHO said. While the Millennium Development Goals (MDGs) focused on a narrow set of disease-specific health targets for 2015, the SDGs look to 2030 and are far broader in scope. For example, the SDGs include a broad health goal, “Ensure healthy lives and promote well-being for all at all ages”, and call for achieving universal health coverage. This year’s “World Health Statistics” also shows that many countries are still far from universal health coverage as measured by an index of access to 16 essential services, especially in the African and eastern Mediterranean regions. Furthermore, a significant number of people who use services face catastrophic health expenses, defined as out-of-pocket health costs that exceed 25 per cent of total household spending. Services face catastrophic health expenses, defined as out-of-pocket health costs that exceed 25 per cent of total household spending. The report includes data that illustrate inequalities in access to health services within countries –between a given country’s poorest residents and the national average for a set of reproductive, maternal and child health services, WHO said. Published every year since 2005, WHO’s “World Health Statistics” contains data from 194 countries on a range of mortality, disease and health system indicators, including life expectancy, illness and death from key diseases, health services and treatments, financial investment in health, and risk factors and behaviours that affect health. 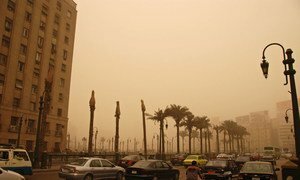 More than 80 per cent of people living in urban areas that monitor air pollution are exposed to air quality levels that exceed guidelines set by the World Health Organization (WHO), with populations in low-income cities the most at risk for respiratory diseases and other long-term health problems.